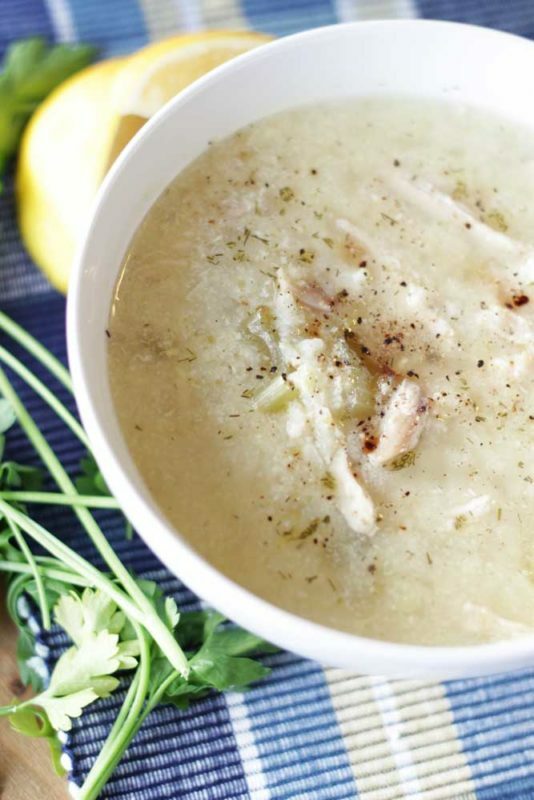 Incredibly tasty and flavorful, this Greek Lemon and Chicken Soup is perfect for cozying up with during the cold winter days! I’m all about soup. I don’t care what time of year it is…I will eat soup every day and I’ll eat it all year long! As a child, I spent the summers at my grandparent’s house while my parents were working and almost everyday, my grandmother (Nanny) would make us a bowl of soup for lunch. On most days, we would have some sort of chicken soup. One day it would be chicken and rice soup, another day it would be chicken noodle soup, or chicken noodles O’s or chicken and stars (yes, I was a Campbell’s soup girl!). Nanny would switch it up every once in awhile and make us her homemade vegetable soup. But my absolute favorite soup Nanny would make was her homemade chicken and rice soup. And what’s funny is Nanny would never call it or recognize it as a soup. I would ask her to make her chicken and rice soup and she would say, “Yes…I’ll make my chicken and rice dish!” It was so funny! To me it was chicken and rice soup because there was a creaminess to the chicken broth, chicken, rice and celery in that dish that she served me in a bowl…so how could this not be a soup?!? Regardless, I let her win and I’d ask her, “Nanny, can you make me your chicken and rice dish?” and she would always make it for me when I asked. 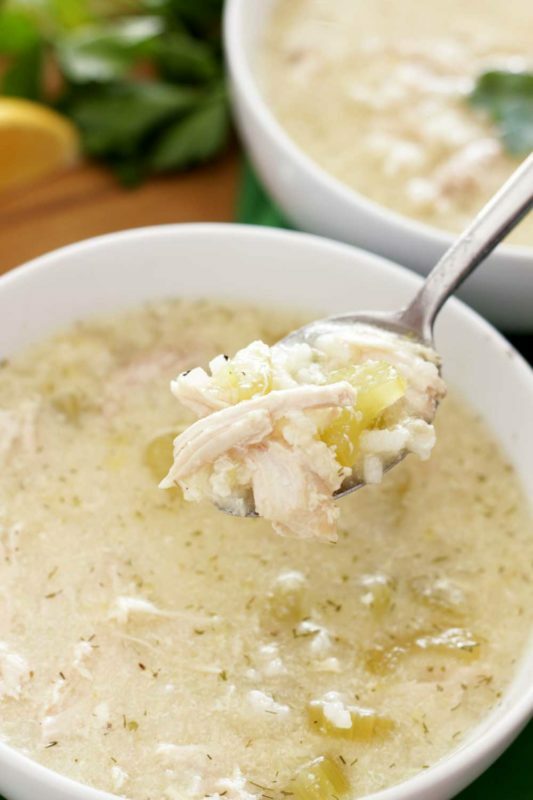 I’ve never been able to recreate Nanny’s chicken and rice soup the way she made it, but when I was introduce to Avgolemono, it reminded me of my childhood. 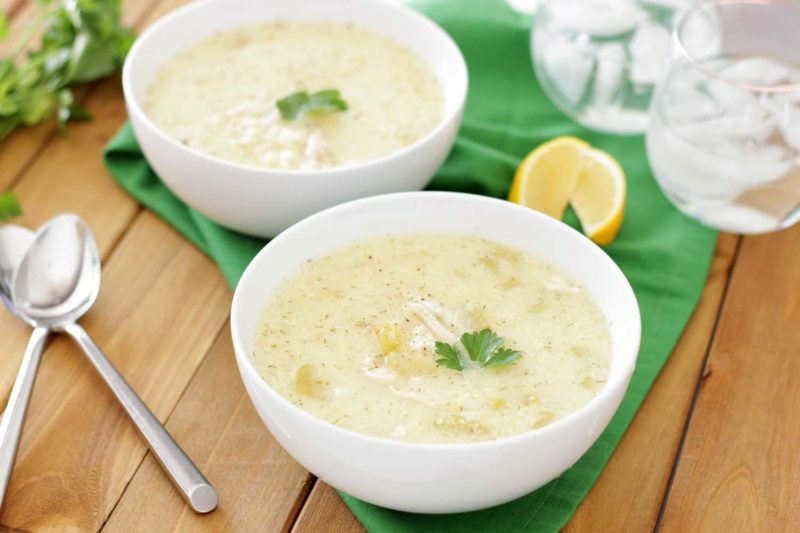 The thing I love about this Greek Lemon and Chicken Soup (also referred to as Avgolemono Soup), is it reminds me of Nanny’s “chicken and rice” dish she used to make me. Nanny’s chicken and rice dish had a creaminess to it and I don’t recall her adding in egg or dairy to make her version creamy, but this Avgolemono soup has a touch of creaminess to the broth and it reminds me of my favorite childhood soups! 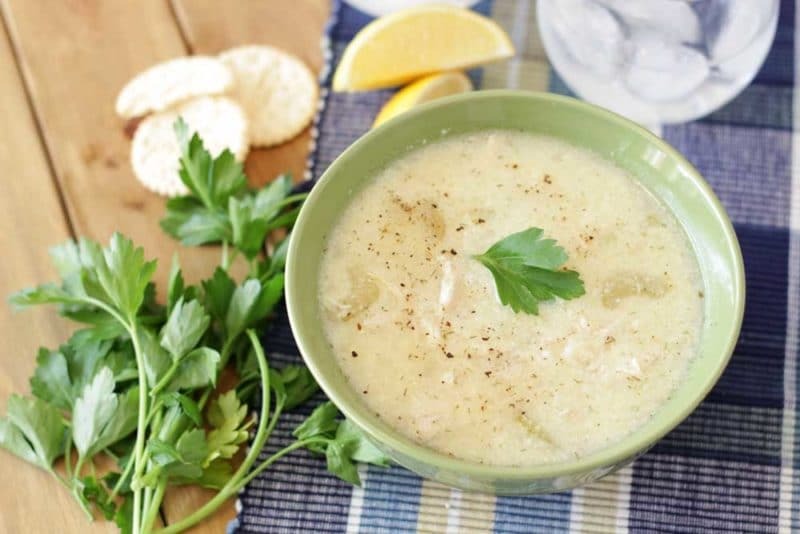 The beautiful thing about this Avgolemono Soup is that it’s both dairy and gluten free! So how do you get that creaminess? Well I’m glad you asked! To get the creaminess, you simply add in eggs! By slowly pouring in 1 cup of the hot chicken broth into the eggs while whisking and then slowly pouring the egg mixture back into the soup is how you get that creamy texture to this soup! Brilliant! 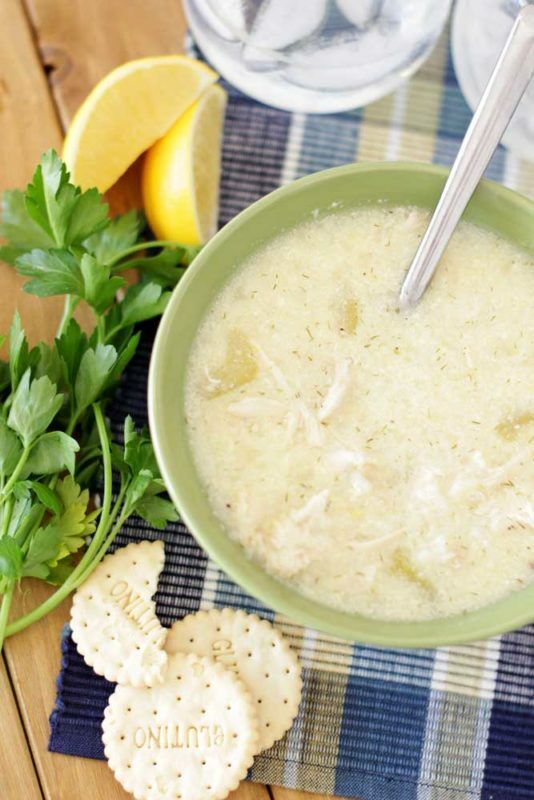 This Greek Lemon and Chicken Soup is so versatile. You can add in so many different ingredients to this soup and it will still turn out fantastic! You can use carrots, celery, potatoes, dill, leek and so much more! In this version of my soup, I chose to use rotisserie chicken, rice, celery, leek, onion, garlic and dill. Every spoonful is so incredibly tasty and flavorful! 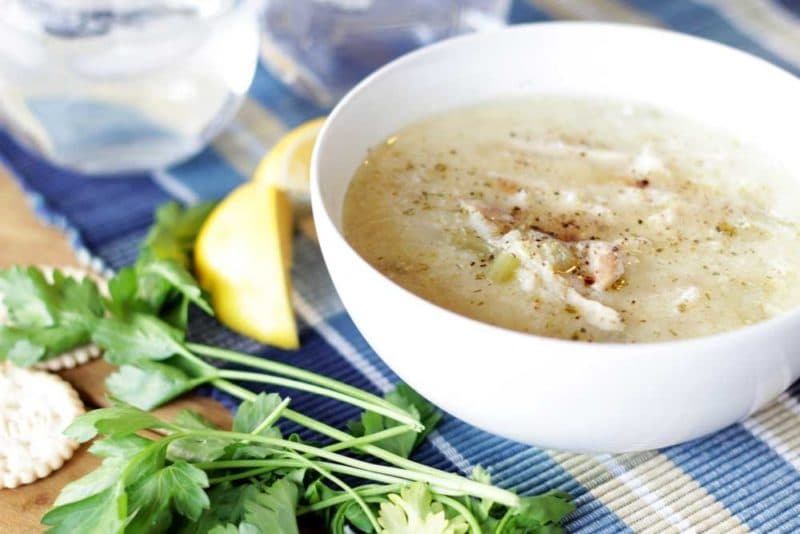 I love to top this Greek Lemon and Chicken Soup with fresh ground pepper, a bit of fresh squeezed lemon juice and parsley! Crackers are always fantastic in soup, so I always dip my favorite brand of crackers, Glutino Gluten Free Crackers, in my soup. No matter how you eat it or what time of year you make this soup, it’s bound to be a family favorite! I think my Nanny would be proud of me for recreating her dish. She’s 85 years old today living in an assisted living home out of state near other family members. I visit her every other year. She’s dealing with dementia and she doesn’t always remember me when I visit. But when I do visit, I always see that glimmer of recognition in her eye and you can tell that somehow….. she knows me, but she’ can’t exactly place how she knows me. Maybe next time I visit her, I’ll bring her a bowl of my Greek Lemon and Chicken Soup and tell her the story of my favorite childhood chicken and rice dish she used to make me and see if it triggers a memory and hopefully a smile. Until then my friends, happy eats! In a large pan, heat the olive oil on medium high heat. Add the onions, garlic, leek and celery and cook until tender, about 3-5 minutes. Add in the chicken broth, water and long grain white rice and bring to a boil. Reduce heat and simmer until the rice is cooked al-dente, about 15-20 minutes. Crack the 3 eggs in a separate bowl. Slowly pour 1 cup of the hot soup broth from the pan into the bowl of eggs while whisking. After the eggs are mixed with the broth, whisk the egg mixture into the soup. Add the rotisserie chicken, dill, lemon juice and lemon zest into the soup and stir well. Cook the soup until it's done, about 5 more minutes.Add in salt and pepper to taste and garnish with parsley. 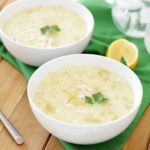 Pin this Greek Lemon and Chicken Soup (Avgolemono Soup) to your favorite Soup board on Pinterest! I too could eat soup every day! My Nana used to serve it to us as well, and she claimed that it cooled her off in the summer! This soup certainly looks delicious and fun! I love the lemon in it and can’t wait to try it out as I’m always looking for something new for my repertoire! Thank you! I hope you will love it! It’s such a mild soup, yet full of flavor! Looks delicious! Healthy and perfect for wintertime! Thanks for sharing! Thanks! It’s perfect for this weather! Super comforting without all those extra calories a thick soup typically has! The flavors in this sound amazing! And I like that you used rotisserie chicken, makes it perfect for busy school nights. Yes! We are all busy so using rotisserie chicken makes things so much easier!! This soup sounds absolutely delicious! So much flavour! Yes, it’s perfect for this time of year! Me and my 5yo both LOVE this type of soup at our local Greek restaurant. I have yet to try making it at home but seeing your recipe has made me crave it all over again! Well, I hope you love this recipe!! It’s SOOO yummy!! Let me know what you guys think! !